As adults we know how important it is to set goals for ourselves. Whether they are personal or professional goals, we understand that behind every goal, there must be a plan of action to help us achieve that goal. Students need to set goals, too. However, they might not have the insight on how to create goals and how to set into motion a plan for reaching it. 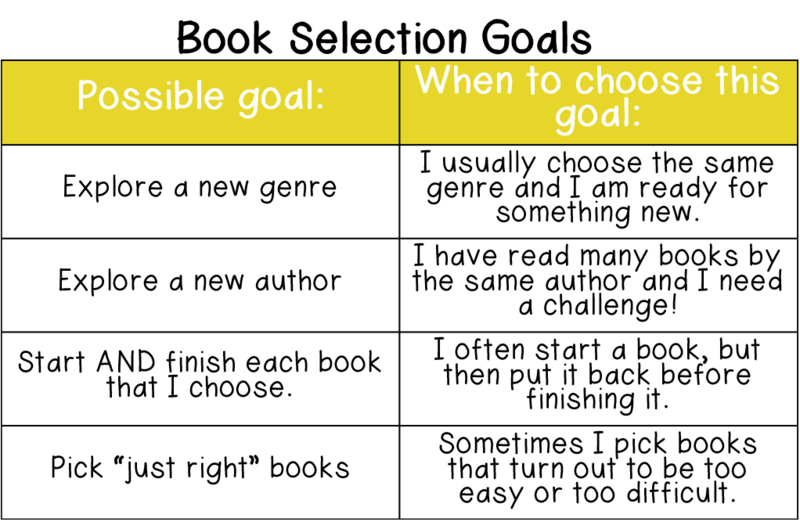 Of course there are many goals students can work to achieve, but in this post I want to focus on goals that students can set for themselves as readers. 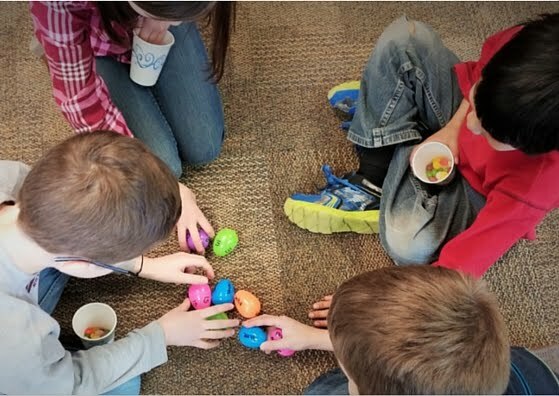 Teachers spend a lot of time teaching students reading behaviors, skills and strategies, but often forget to teach students how to identify which of those behaviors, skills, or strategies they need to work on by setting goals for them. So, let's talk about that! 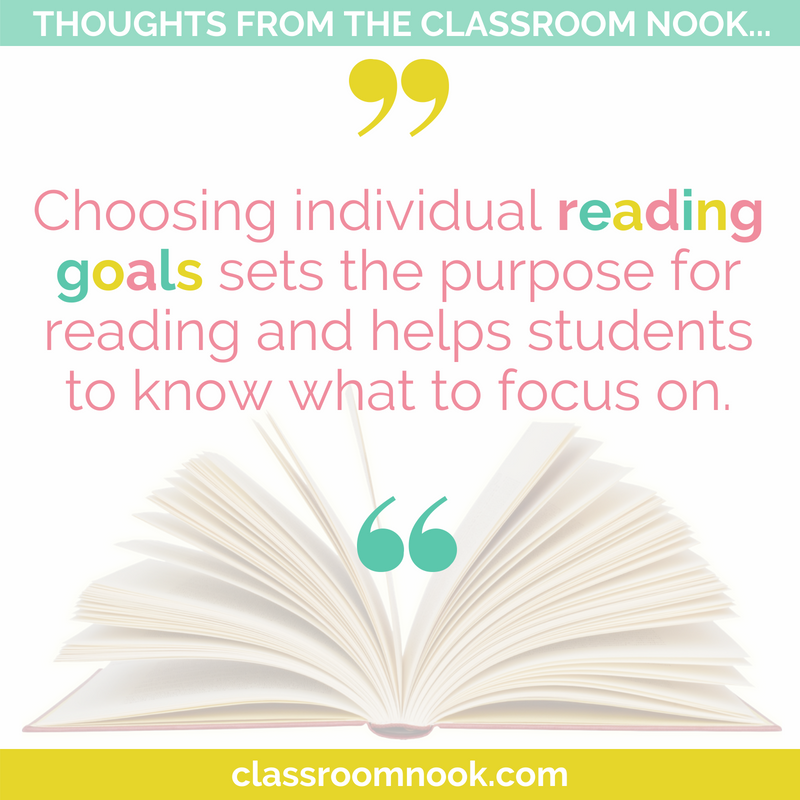 Choosing individual reading goals sets the purpose for reading and helps students to know what to focus on when reading. As a teacher, it gives you instructional guidance for what to work on during your individual reading conferences. WHAT TYPES OF GOALS SHOULD MY STUDENTS BE WORKING TOWARD? This helps students narrow down for themselves what types of goals might best benefit them. 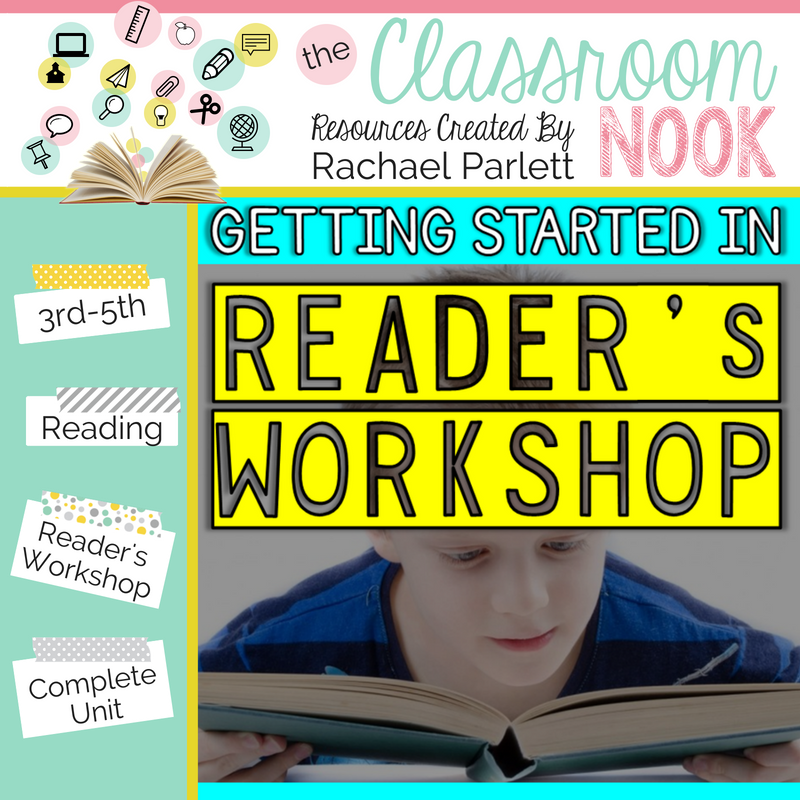 Of course, at the beginning of the year, selecting goals is going to require a lot of guidance on your part, but as the year continues, selecting goals will become part of routine in reader's workshop. Let's look more closely at each type of goal. 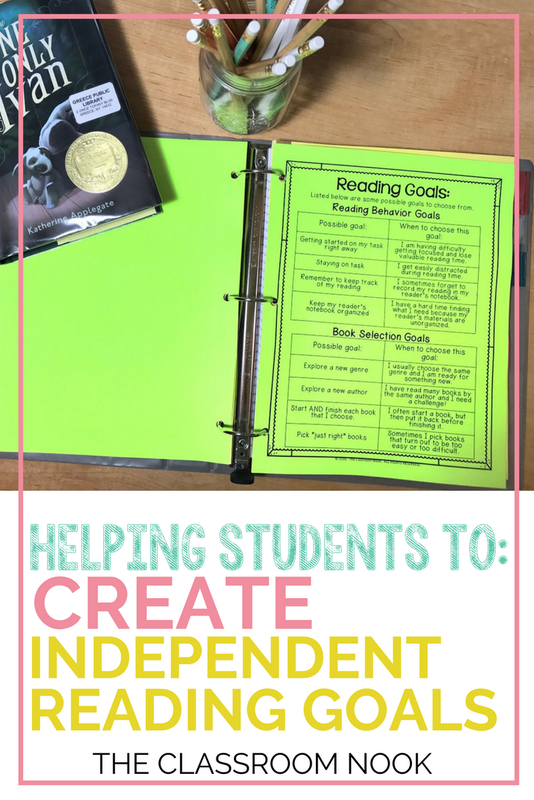 I provide students with a resource guide that I have them keep inside of their reader's notebook that they can reference when selecting goals. On the sheet is a list of potential goals under each category along with tips for when it's appropriate to select each goal. Of course, students are not limited to the goals on this sheet, but it helps get them thinking. 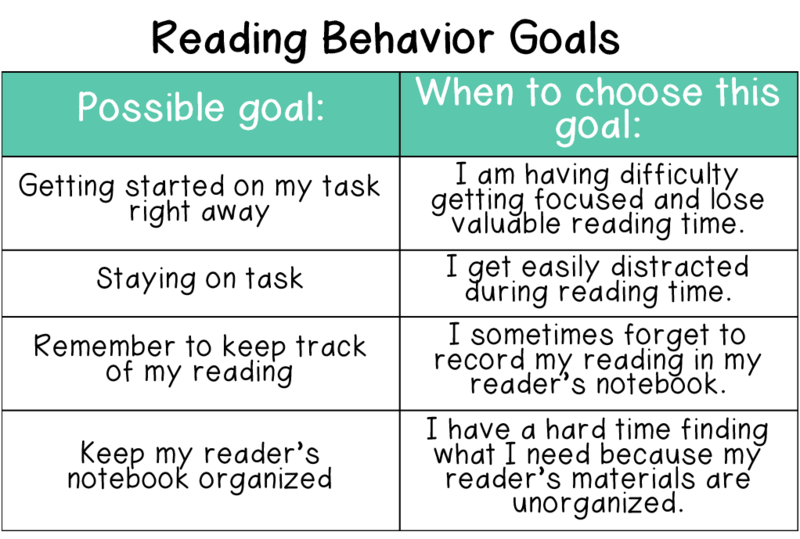 Some students need to start by focusing on their "Reading Behavior" goals during reading. This category is a popular goal for the beginning of the year as students are learning about your classroom expectations and routines and procedures. Other students who struggle with choosing books that are a good fit might select a goal from the "Book Selection" category. This category also helps students who need to widen their reading choices with a new genre or author. 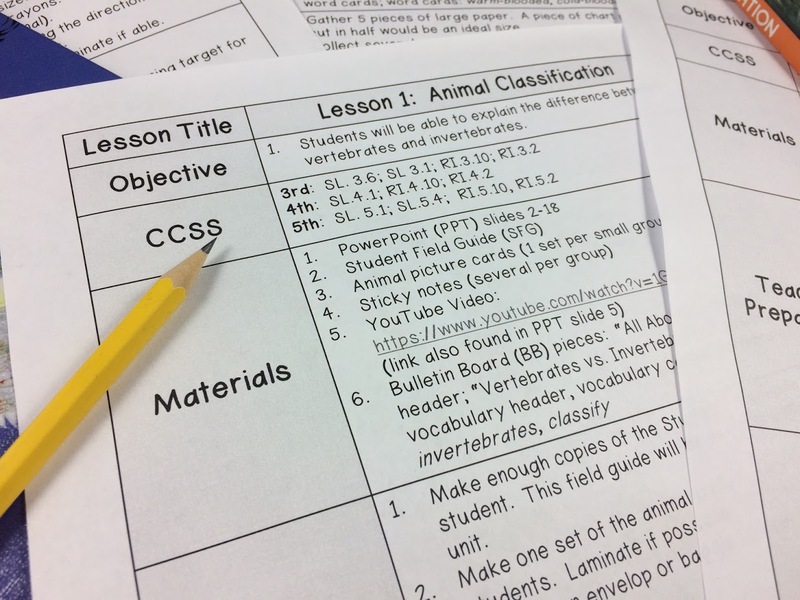 The final section, "Reading Strategies," is a section that all students will select from at one time or another throughout the school year as you introduce skills and strategies in your mini-lessons and guided reading groups. I always choose a goal and develop a sample plan with students so that they can see the process in action. 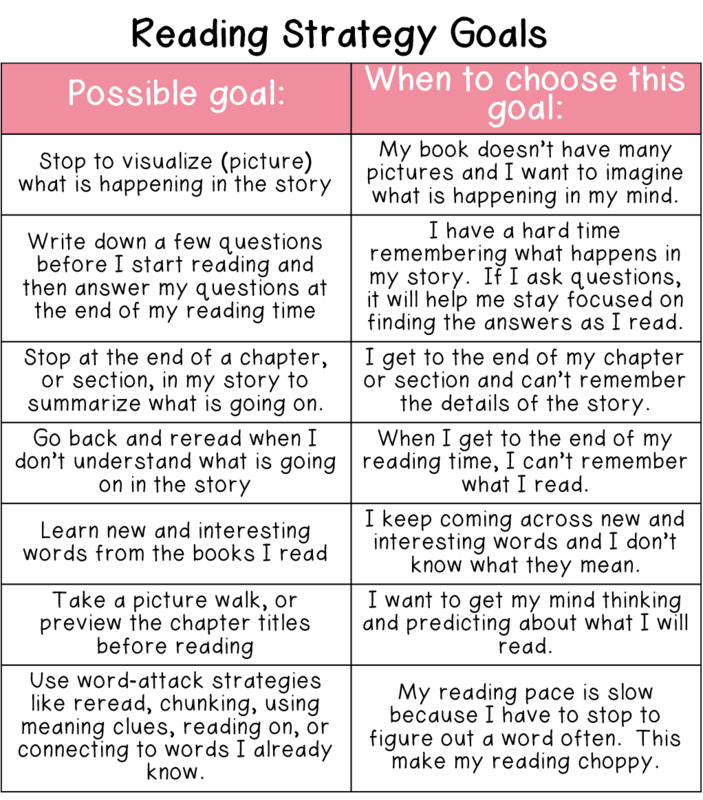 For examples, if my goal is a reading behavior goal to stay on task, part of my plan to reach my goal would be to practice choosing reading spots in the classroom away from other students so I'm not tempted to talk to them when I'm supposed to be working independently. I encourage my students to only choose 1-2 goals at a time, and to work on that goal for at least 1 month in order to really show mastery. I use reading conferences as a time to talk with students about their goals. During reading conferences you can model a tip or strategy that will help them reach their goal and observe students putting their goal into action. At the end of the month, students spend time as a class reflecting on their goals and writing in their reader's notebooks on how they think they did. If we agree that they've reached their goal, students choose a new reading goal. If the student is still struggling with a goal, we keep it, but change the plan or try a new strategy to reach that goal. 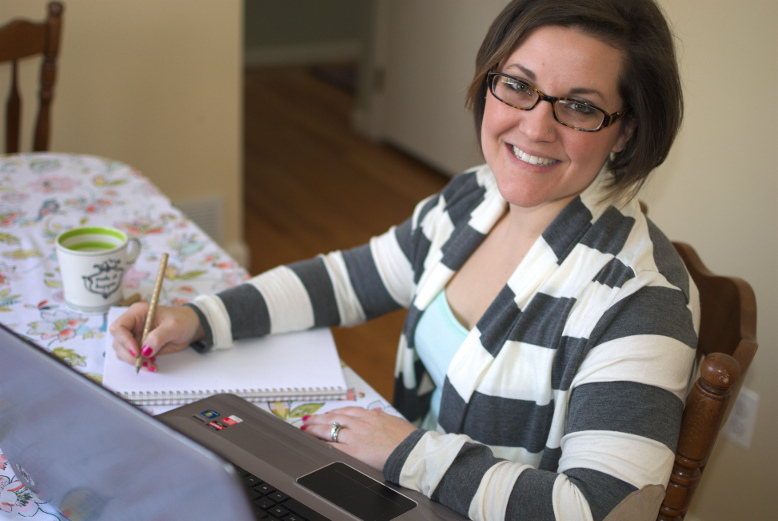 For an entire post on launching reader's workshop, check this out!